This is the cheapest option as it includes the backing board. Can take any engraved plaque up to 4" 100mm high and 6" 150mm wide. 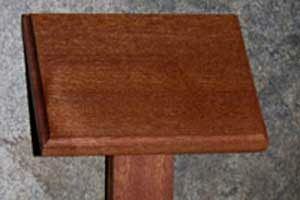 The timber is sapele which is very rich, lustrous, and variable reddish-brown colour give it a mahogany-like appearance. However unlike most mahoganies, Sapele has substantially less movement in service. It is also even harder than oak. It is moderately durable and should always be maintained with oil or varnish. When finding the price of a backing board you will need to add about 1 " 25mm to the size of the plaque. eg plate 4" x 6" will need a backing board 5" x 7". This is a beautiful and quite unusual wooden tree stake with its cut out cross design, excellent value for money.